I've now read through the first three sweater recipes in Knitting Without Tears by Elizabeth Zimmerman for the Canary Knits Knitting Book Read-a-long. Unlike the first time I read this book, I totally get them. I'm on a DIY-type high because of this, which has prompted me to order some sale Wool of the Andes that I hope will look good as the main color for my own Seamless Yoke Sweater (pattern #2). The contrast color will be Gynx Yarn's merino Aran in the Totoro 2 color way. I'll finally, finally be using it! I may chart out my own Totoro but I have found plenty on Ravelry. I shouldn't have been surprised to find that there are tons of Totoro yoke sweaters there, or that many were made using Elizabeth's recipe. I'm hoping mine will turn out something like this. 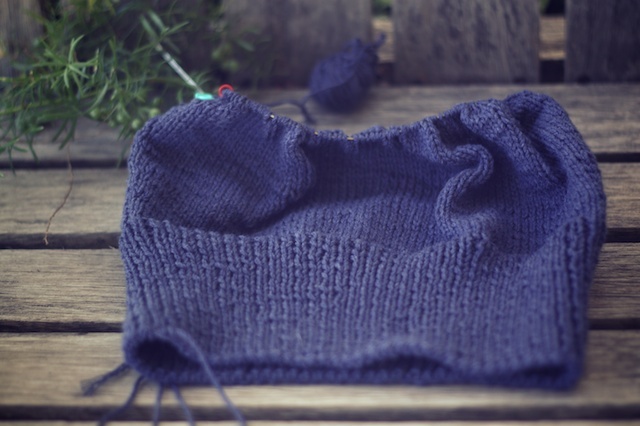 Though I'm completely intrigued by the idea of knitting a sweater in three uninterrupted tubes and using steeks to cut holes in the body tube in which to attach the sleeves, the second recipe for the yoke sweater is the one that's calling my name. I've been wanting to knit that kind of sweater for a long time, and her breakdown of the math makes it so easy. I may even try continental style knitting when I do it, for fun. As I read about Elizabeth's knitting style, I couldn't help but wonder if it would solve my gauge problems. What you're seeing here is my second try at Riverine. My gauge is out of control. I'm fixing to have to invent the - 1 sized needle. 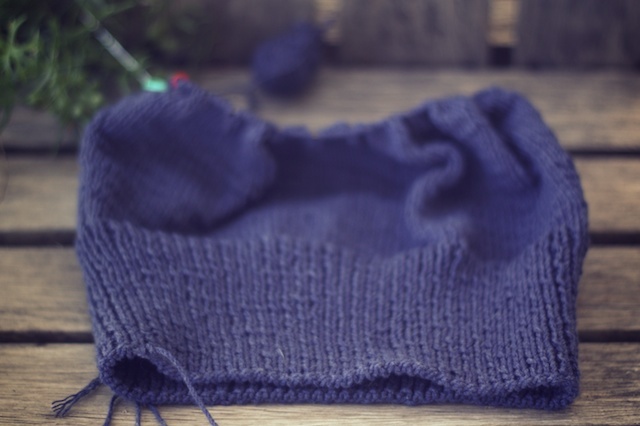 I felt like I was knitting so tightly the first time around, but when I reach the armholes, I realized I'd loosened my tension and was one stitch off per inch. So the 32" instructions I used, knowing my sizing issues, in order to get more of a 34", actually turned out to produce a 36". It took a whole episode of Longmire to rip out. I didn't even know what was going on I was so annoyed. There was no other way around re-knitting this, so I worked like crazy the next two days and am close to the armholes. This is .5" off per inch, but I knit the 30"... on size 0 needles. I have no where to go from here. If it doesn't fit, my daughter can throw it in the bottom of her closet. So would switching to continental knitting help me with this? In Knitting Without Tears, she talks about her change from English knitting to the taboo continental. In English style she'd put the needle through, throw the yarn over it, then pull the new stitch through. For continental she began running the yarn over her left forefinger in the correct position to simply hook the needle around the yarn while sliding it through the stitch. There is some economy of movement there. I realize two movements instead of three doesn't sound like much, but after thousands of stitches it might make a difference on the joints, not to mention speed. In fact, she claimed to be a moderately paced knitter clocking no more than 51 stitches a minute. This is the point in the book where I realized I'm actually a slow knitter. I knit about 34 stitches per minute. Maybe continental knitting would help me mow through my queue faster. I thought I would give it a try since I did pick with my left hand once when doing two-handed fair isle. I also thought the change in yarn position might give me more even tension than right-handed throwing. It was like writing left-handed. Of course, it was a 1x1 rib row, and purling is evil enough in the knitting style I'm familiar with. I will say that it did tighten things up a lot. The knitting was so tight that I went back to knitting English for the remainder of the project. Continental also seemed easier on my left wrist. I don't usually suffer from wrist strain, unless I try pull ups, push-ups, weeding, and knitting all in the same day. But how likely is that to happen? It's just that knitting with 0s can be hard on anyone. Another theory behind my floppy stitches could be the needle type and sizes I use. I've been partial to Addi Turbo's in a 24" length, the length EZ preferred, saying the extra inches on longer needles just got in her way. However, I notice when using them in small needle sizes, the stitches seem to knit so quickly they fall from left to right needle before I can do that little split second adjustment for tension with my right hand. That could be due to the metal, the tiny needle size, or the fact that the stitches for a 34" top don't spread out fully on 24" length needles to automatically adjust the tension. I don't know if that even makes sense. But I can say that I have less trouble with keeping gauge on wooden needles. I don't know. No one else seems to have this problem. Anyway, I've been adding some wooden circulars to my collection, so I'll be experimenting through the Summer Sweater Knitalong. Hey, when you knitters talk about knitting continental style do you ever think of this? about different needle types & flat vs circular and what affects they have on gauge. It was VERY interesting & could help you out. Just have to say- I love reading your blog! Thanks! Oh great, Brenda! I'm glad you enjoy my ramblings. This site and Ravelry are where I meet some of the best people! I'm off to check out your link now. Okay, so maybe metal does encourage looser knitting! Thank you, BethAnn! I'm going to read the link Brenda posted above and see if I can start normalizing things before I get in too deep with all of the summer knitalongs. Wooden needles probably do help you out a lot because they grip the yarn better. I've always used metal because my knitting used to be so tight, I couldn't get the stitches to move unless they were on slick metal. Everyone else I know hates metal needles, lol. I can't wait to see how the switch works out for you! I discovered Continental knitting when I had a German classmate, who saw me knitting a scarf, and commented that I was "a very slow knitter". At this point I was only knitting for a year or so, and I never even realised there could be other knitting techniques. She showed me how to knit Continental, and I tried a couple of projects, but I just couldn't get used to it. My knitting always was uneven and wonky. (I also never heard of "blocking" at this point in my knitting career). I gave up trying to learn and stick with my familiar English style. It's also easier this way, because I ask my mom for knitting advice all the time, and she's the one who taught me how to knit. I also knit on metal needles because I'm a very tight knitter and metal needles seem to help. I love the look and feel of wooden needles though. They are so much prettier, too. I'm sure you'll figure out a way around your problem, as you always do. And your Riverine is looking pretty good to me!!! This post spoke to all my own concerns so perfectly, I can't believe I missed it on Thursday! I'm an English knitter too, and the more I watch video podcasts, the more I notice other people knitting Continental and zipping along so much faster! I've been wanting to switch, but not until I start a completely new project, or my gauge will be all over the place. I'll take the challenge with you and try to knit my next KAL project continental...maybe we can be moral support for one another? I have a feeling we'll need it. Maybe I'll try a hat first just to get my feet wet. Oh, and by the way, I don't typically use metal needles much because they absolutely make me knit looser than wood. But...have you ever tried Kollage Square needles? A woman at my LYS mentioned that they seem to knit at a gauge one needle size smaller, as in, knitting on a 1.5 gets you the gauge of knitting on a 1 on other needles. I've found this is true for me and it's great since I always have to go down about one needle size. Thanks, Severien! It is my second go at Riverine, but I'm happy to say it does fit. I like the fact that Vanessa, in the comment below, uses continental but still finds an opportunity to knit English style when a loose gauge is needed. I love wooden needles too, but, as I found yesterday, they often get snapped. My Addis are indestructible. My knitting time has diminished some, so maybe switching to continental will compensate a bit. Okay, I'm in! 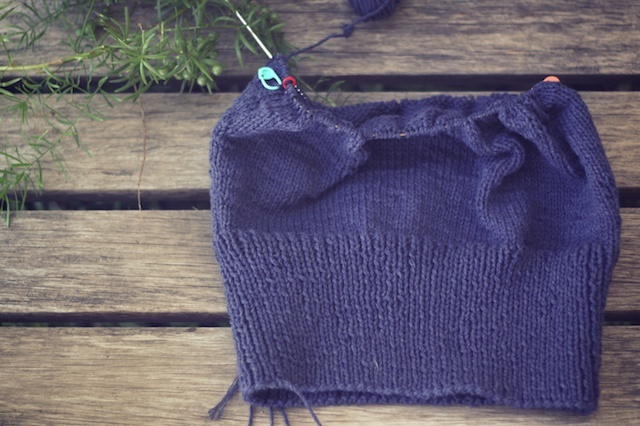 I plan to knit worsted and bulky things for two KALs, so maybe they'll make it easier to learn to pick. I'm excited by the thought of using normal needle sizes again. I haven't tried Kollage, but I hear lots of good things about them. If switching styles doesn't affect my gauge, I'll definitely try them next.